This weekend was exactly what I needed. My mother-in-law came to visit, which meant BL and I took full advantage of our sitter and crammed as many dates in as possible. We checked two more movies off our Oscar list (I, Tonya and Three Billboards outside Ebbing, Missouri) and hit up a few of our favorite restaurants. Don’t get me wrong; motherhood is the most amazing thing I’ve ever experienced, but it felt so nice to have an extra set of hands for middle-of-the-night feedings and the freedom to leave, even for just a few hours. 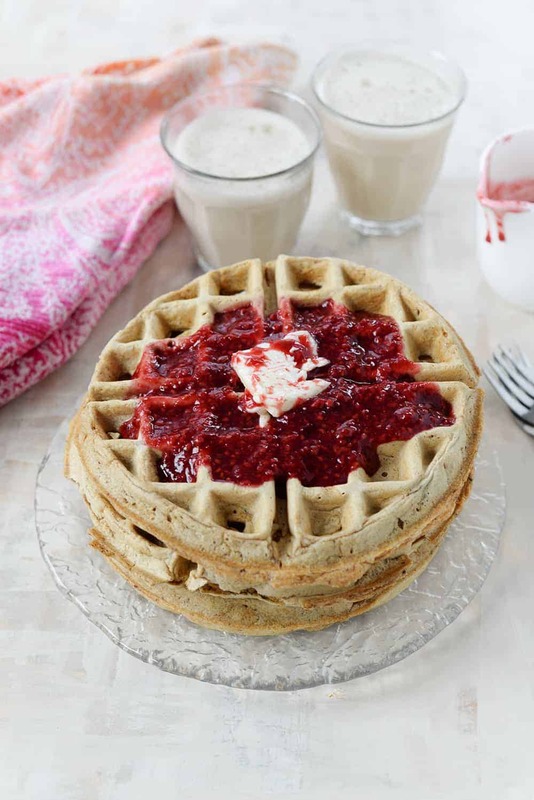 On Saturday morning, we left Van and went on a nice long walk before breakfast, then came back to a meal of these whole-wheat waffles and a cup of my cashew chai latte. This beverage has completely changed my morning routine. I swear I start thinking about it the moment my eyes open, especially after another long night. It’s so warm and cozy, and pairs well with baked morning treats and my favorite baked oatmeal. I first got the idea when my friend Amanda told me that she made her own chai concentrate. Mind completely blown. You could make your own chai concentrate!? I’d been spending $5 a week on chai concentrate for as long as I can remember, completely unaware that you could make this yourself. I went home after that brunch and tried it for myself– threw everything I knew about chai spice into some sweetened water with lots of tea bags. I’ve tweaked that recipe a few times and this creation is my favorite balance of spicy and sweet. I’m still kicking myself for not knowing about this hack earlier. If you love chai tea as much as I do, then you’ve gotta try this. It lasts for a week or so in the fridge; simply combine it with whatever milk you like in a 1:1 ratio. 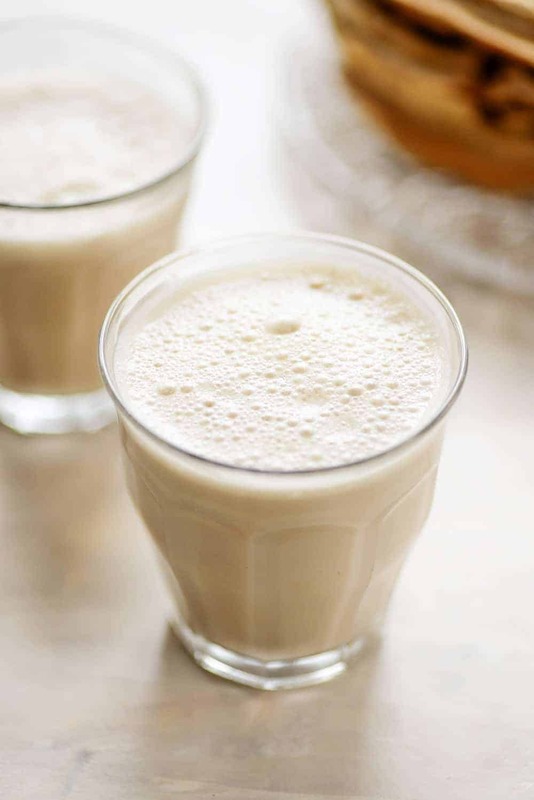 In the summer I was drinking this over ice with almond milk, now I combine it with raw cashews and warm almond milk in a blender for the ultimate latte. Cashews will thicken as they warm and then cool, so you don’t want to make this and then heat it up. Or, if you do, only heat is as much as you need for it to just become warm. I made the mistake of making this and then putting it in the microwave for a minute to warm it up and I got a thickened mess. It still tasted good, but way to thick for a latte. When I make this warm, I heat the milk and the concentrate together, then add to a blender with the cashews. I gently open the lid a few times while blending to release any stem. Then, it’s good to go. Seriously, this cashew chai latte tastes like a hug for your month. It’s incredible. 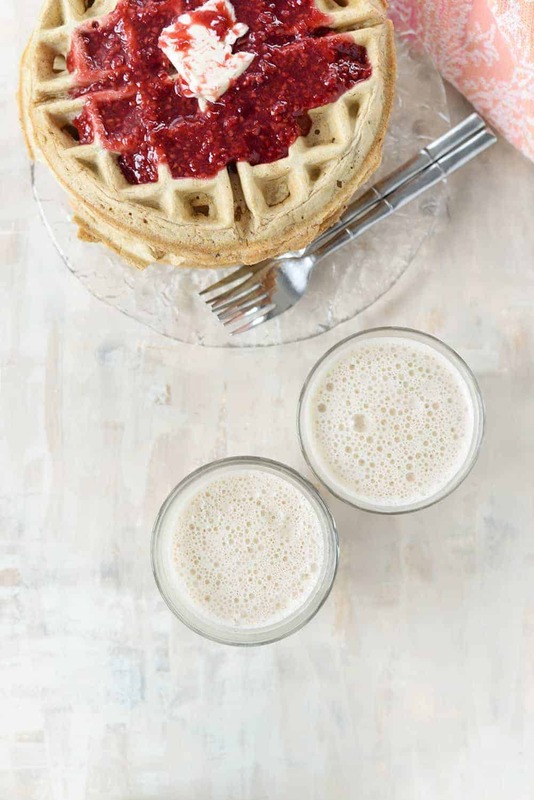 For a cold version, puree everything in a blender first and then drink as is or pour over ice. I’ve included the option for adding in a bit of sweetener to it, which is completely optional. I made this concentrate lightly sweetened. If you are used to overly sweet chai (like the kind at Panera/Starbucks), then you will likely want to add a little bit more sugar to either the concentrate or when you blend it together. Taste as you go to determine how much you need. Chai Cashew Latte! Want a creamy, dairy-free chai latte? 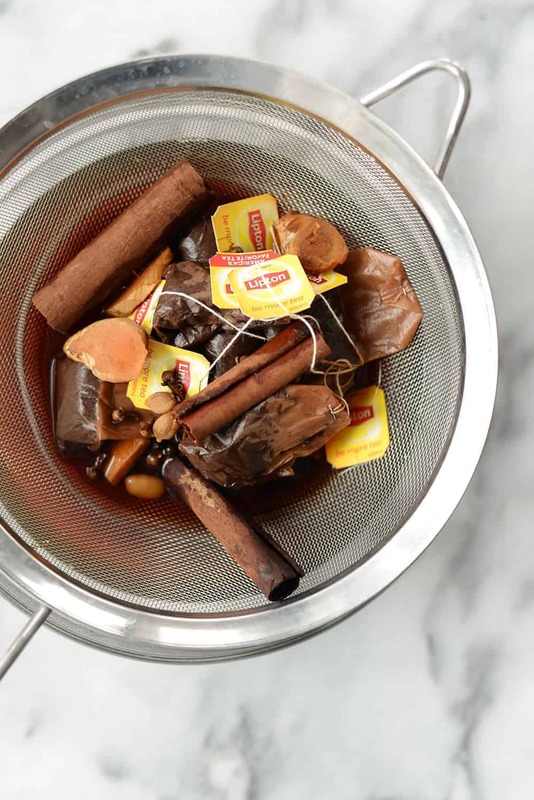 Save this recipe for DIY chai concentrate made with raw cashews. Gluten-free, vegan, dairy-free, vegetarian and DELICIOUS. Make the chai concentrate: In a medium pot, bring the water and sugar to a boil and simmer until sugar is fully dissolved. Add the spices, and continue to simmer on low heat for 15 minutes. Remove the mixture from the heat, add the tea bags and let them steep for 15 minutes. Strain out the spices using a fine mesh strainer and place the concentrate in a glass jar and place in the fridge. It will last for at least a week, but I promise it won’t last that long! To make a hot cashew chai latte: heat 1 part chai concentrate with 1 part milk of choice on the stove until warmed through. Place in a blender along with 1/4 cup cashews for every 1 1/2 cups of tea/milk mixture and maple syrup, if desired. Be careful when blending hot liquids! I opened the top of my BlendTec every 10 seconds or so to let steam escape. Because the cashews will thicken the mixture once blended, I don’t recommend blending and then heating. Heat the tea first, then blend. To make a cold cashew latte: Soaking the cashews ahead of time will make them easier to blend. Drain, then blend with 1:1 parts chai concentrate and milk and sweetener, if using. I get that vanilla beans whole are expensive. Therefore, I recommend making the concentrate without the whole beans (they will provide more flavor than extract, however) and then adding in 1-2 teaspoons of vanilla extract when you add in the tea bags. Raw, unsalted cashews are best. I think Trader Joe’s has the best prices on these. I love chai and love that you are doing a home made version! The boxed kinds never taste the same!